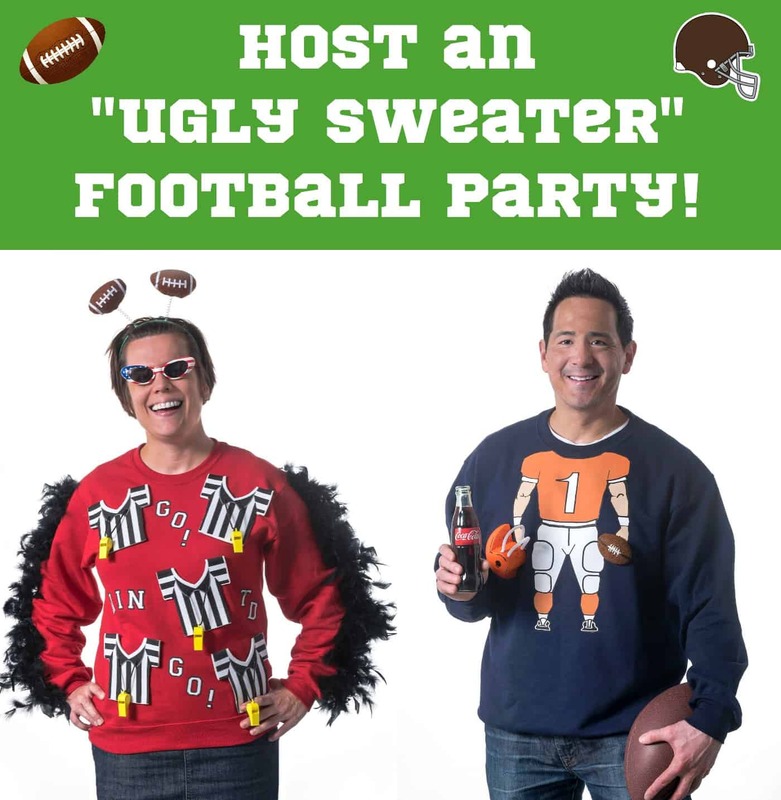 Home / Sponsored / Have An “Ugly Football Sweater” Party! 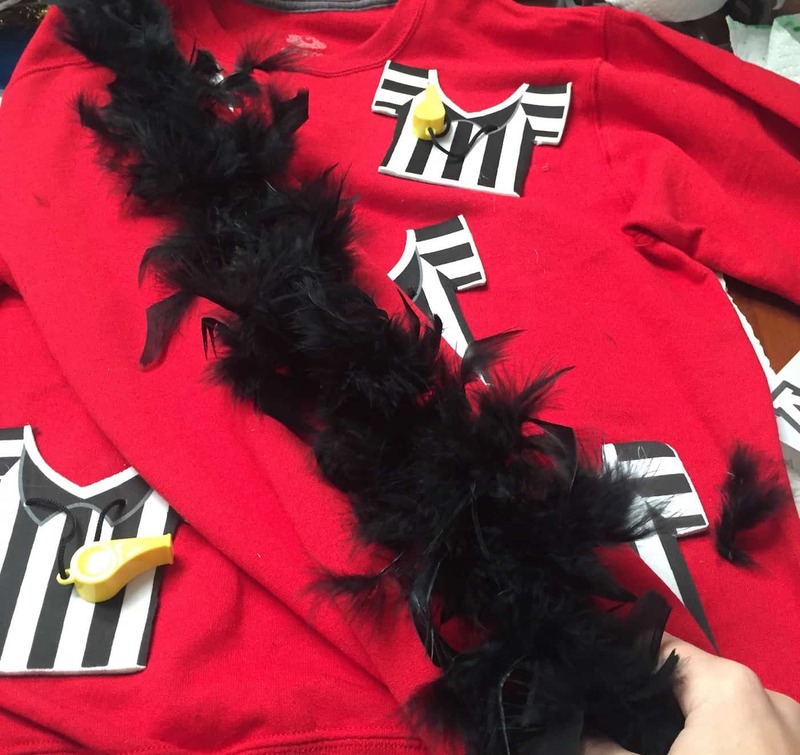 Learn how to make two versions of an ugly football sweater – with free printables! Also get tips for a successful party. SO easy and fun! I do a lot of posts I enjoy on this blog but this is one of my favorites – of all time. I know it's a bold statement, but it's one that I'm totally comfortable making. With football season here and the most anticipated football game of the year coming up, I decided it was time to do a REALLY fun project inspired by “ugly Christmas sweaters. You know the trend, right? It was all the rage this past holiday season, with parties where guests competed to have the ugliest sweater at the event. 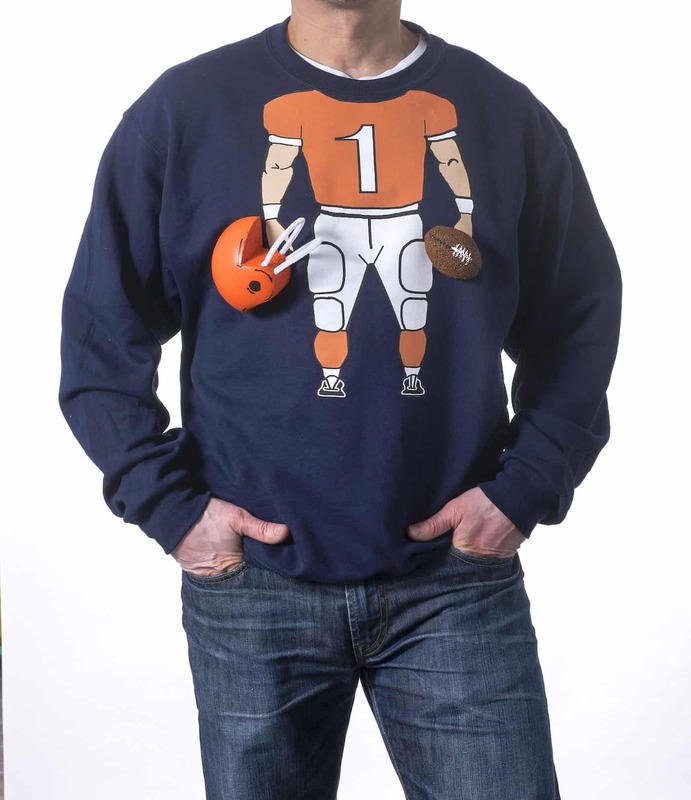 I've decided to continue the “ugly sweater” trend into football season, and that means I have a great idea for you – host an “ugly sweater” football party! I'm going to give you tips for how to host your own, and I'll also share how we made our own “ugly sweaters” (which are actually sweatshirts). 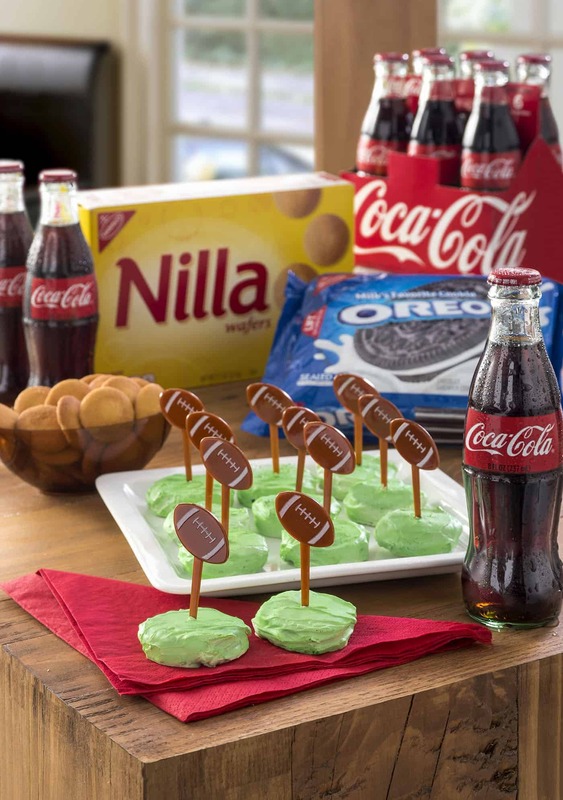 I’m partnering with Coca-Cola and NABISCO this year to bring you these tips along with a recipe so that you can have the best football celebration ever! 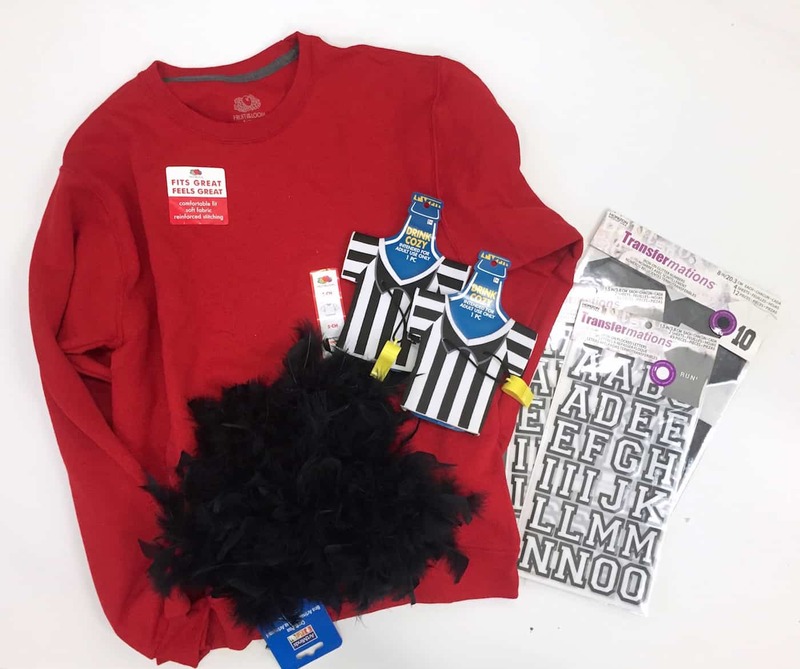 And whether you decide to have an “ugly football sweater” party or not, you can get tips from the Home Bowl 2016 site to ensure that your next football celebration is a success. I also have a contest at the end of this post. Let's get started! Before I get into the tips, I want to share how our “ugly sweaters” were made. Now, it's called an ugly sweater party, but that doesn't mean you really need a sweater. You can use a sweatshirt like I did, or even a long sleeve shirt. 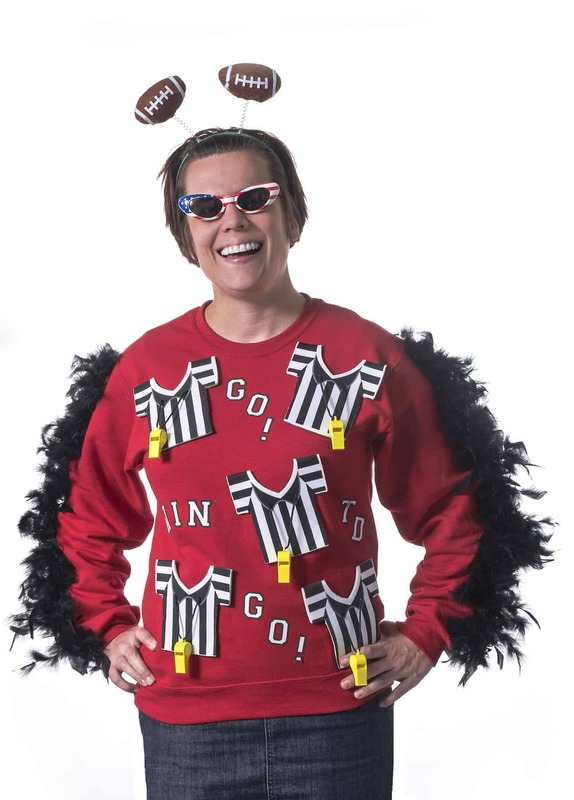 The point is that the sweater/sweatshirt/shirt is a canvas for the gaudiest and ugliest fan shirt possible! You're going for glitz and shock value. And laughs, of course. My sweatshirt was really easy to create. I was so excited when I found these referee drink cozies! And guess what – the whistles work. Isn't that amazing? I purchased five of them and cut them up the sides. I only used the fronts so that I could have the whistles, but technically you could use the backs of the cozies as well. I placed them down on my sweatshirt to get an idea of where I wanted them to sit. Then I glued them down with a hot glue gun and glue sticks. If you're wondering, this sweatshirt is not washable – but that's okay, because it's only for special occasions! Once the cozies were glued down, I folded the sleeve flat so that the back crease of the arm was showing. I trimmed the feather boa to fit the length of the sleeve, then hot glued it down. Don't try to glue the entire boa down the whole sleeve at once because the glue will cool. Do it 1/3 at a time. Let cool and repeat with the other sleeve. The final step for my sweatshirt was to cut the iron-on letters and place them in the areas between the cozies. Use phrases like “Go!”, “Win”, “TD” or even your favorite team names. You can say whatever you like! Following the instructions on the package, iron down your letters. Let cool and then peel up the backer paper to reveal the finished design. 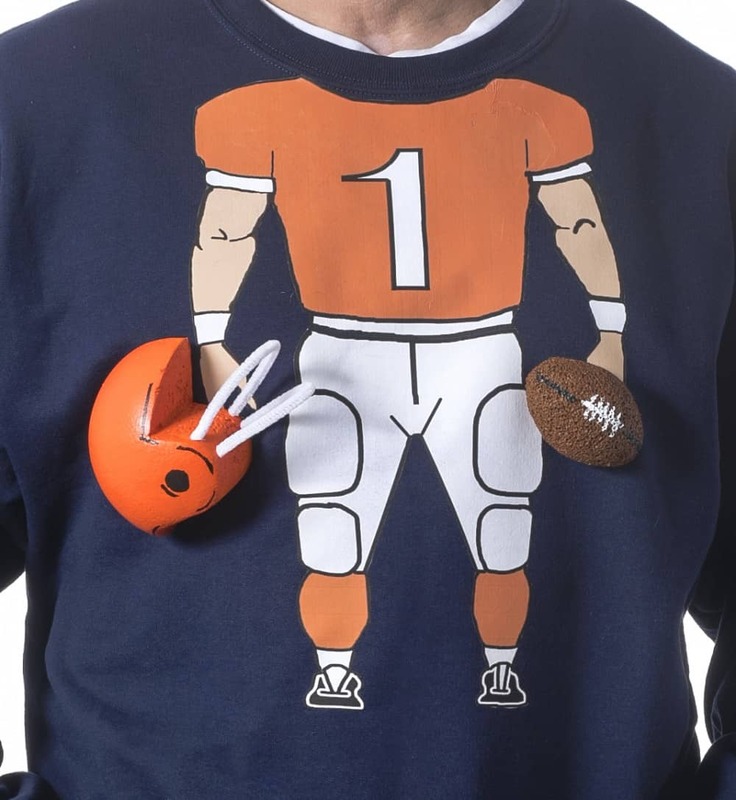 Pair your ugly football sweater with some crazy glasses and football head boppers and you're ready to go! But we didn't just make one ugly football sweater – we made two! The second version is a bit more guy friendly and we have a printable to make it really easy for you to make. You're going to start by cutting the helmet out of the circle of foam. You can purchase these circles of foam (that are flat on the back) at any craft store! To create the helmet, you'll draw the shape of a helmet with a permanent marker on the top. Then you'll use a sharp knife or electric knife (either one works) to cut out your shape. Please use caution when using these tools! 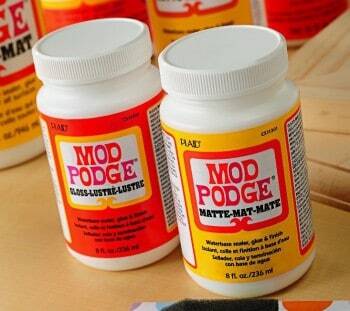 Smooth the cut edges with 80 or 100 grit sandpaper. If you want your helmet even smoother, finish with a sanding using a very fine grit. Next you'll create the football with the foam egg. 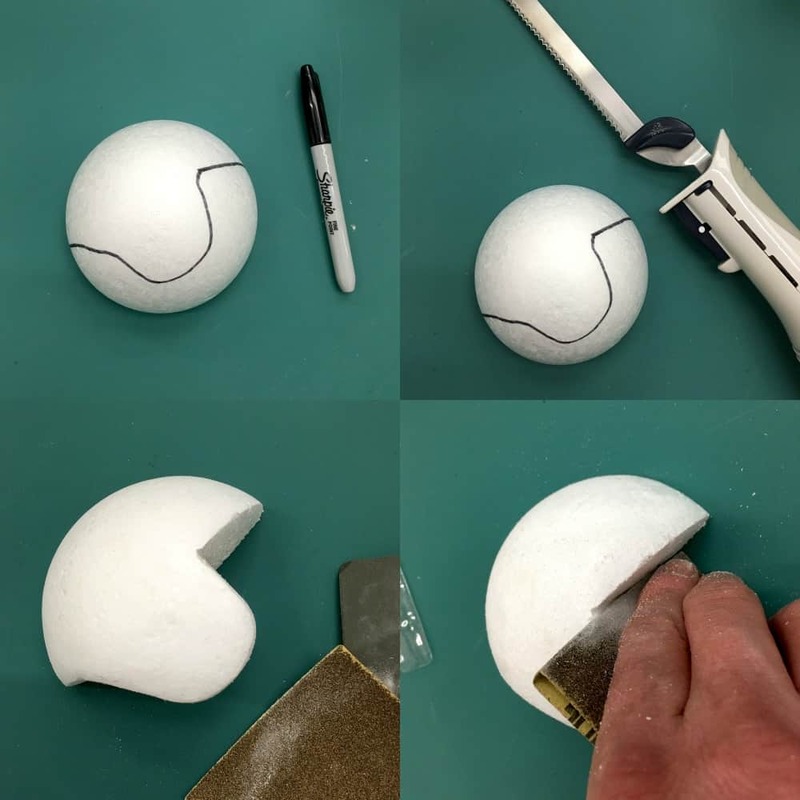 All you need to do is use sandpaper (we used a sanding block) to form the egg into a football – which mostly requires sanding the larger end (the base) of the egg. Once you've got your shape, cut the egg in half with a knife. Be sure to cut away from your fingers! Paint your helmet in the colors of your choice. We added details using black on the helmet and white and black on the football. To make the football chin straps, cut a pipe cleaner and simply insert into the helmet. No need to glue because the pipe cleaner ends fit right in. 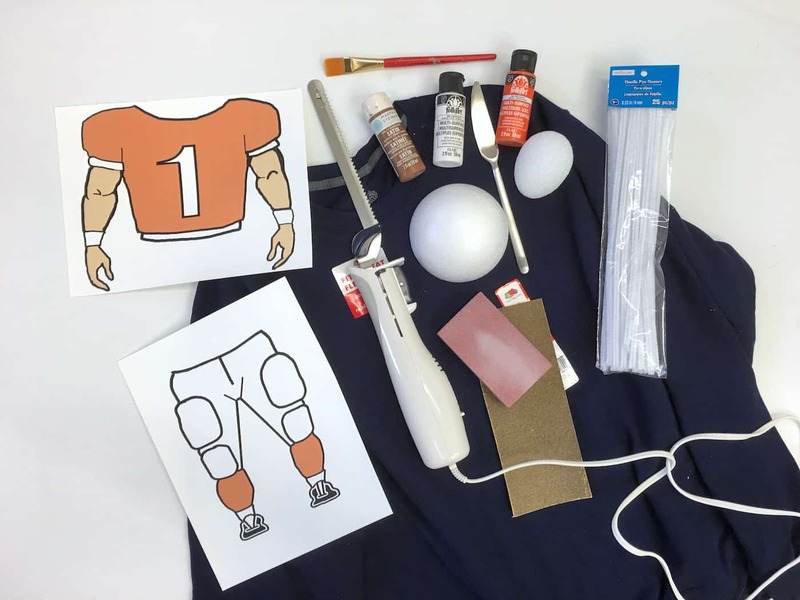 Print your football player body (get them HERE) – you can combine different jersey and sock colors! Following the instructions on the package, iron your football player body directly below the neckline. Note: our iron-ons did not require reversing! You'll want to purchase iron-ons that don't require that you reverse the image. 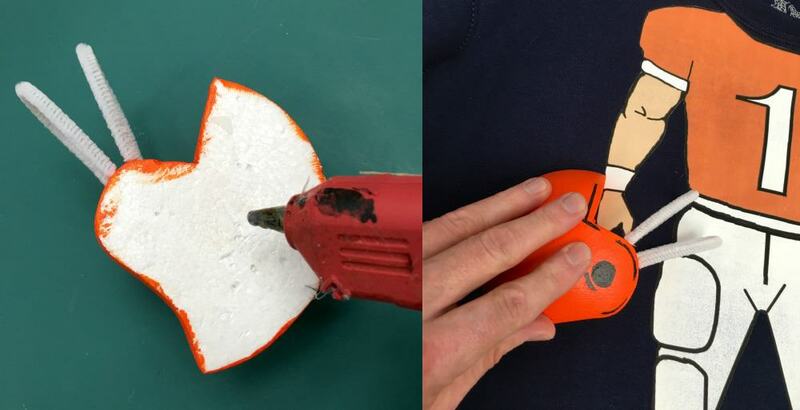 Glue the football helmet and football in the player's hands. If you want to make sure that you can wash the sweatshirt, you can use Velcro. Now that we've shared our ugly football sweaters, it's time to share a treat we developed that you can use at your own ugly football sweater party! I call them Field Goal OREO Cookies! All you need to do is dip OREO Cookies into melted white candy melts, allowing them to coat. Pull out and place on the wax paper to cool. Once cool, spray with edible green color mist and let dry. 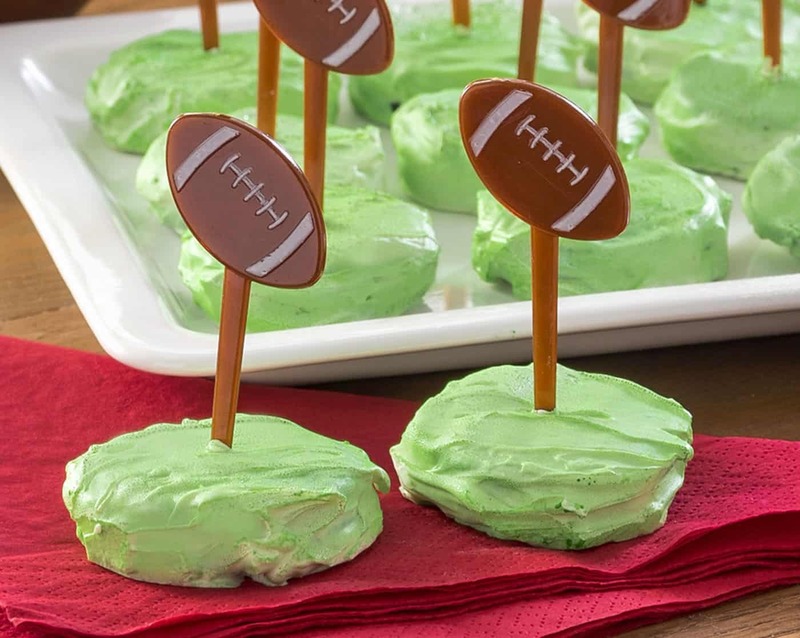 Place a football topper directly into the cookie! Don't they look like little greens with footballs flying over? I think they are so fun! And of course, they are delicious as well, with the OREO Cookie inside! Enjoy with a delicious Coca-Cola. Now are you ready to host your own ugly football sweater party? Here are my tips! Make the invitations fun and exciting. Have it reflect the feel of the party. You want the invites to be a little wild and crazy, just as you would expect with an ugly sweater theme. Get colorful! Encourage attendees to go all-out. Everyone should decorate and wear their own “ugly sweater” – but also encourage them to wear hats, jewelry, scarves, glasses, or anything else that will compliment their sweater. Remember – the bolder, the better. Host a contest. This is an extra incentive that will get guests to put their all into it. Give awards for best team pride, best overall sweater, ugliest sweater, etc. Even if they are just printed certificates, everyone loves a little competitive spirit. Serve delicious food. I've done another Home Bowl post with NABISCO and Coca-Cola recipes that you can see HERE. 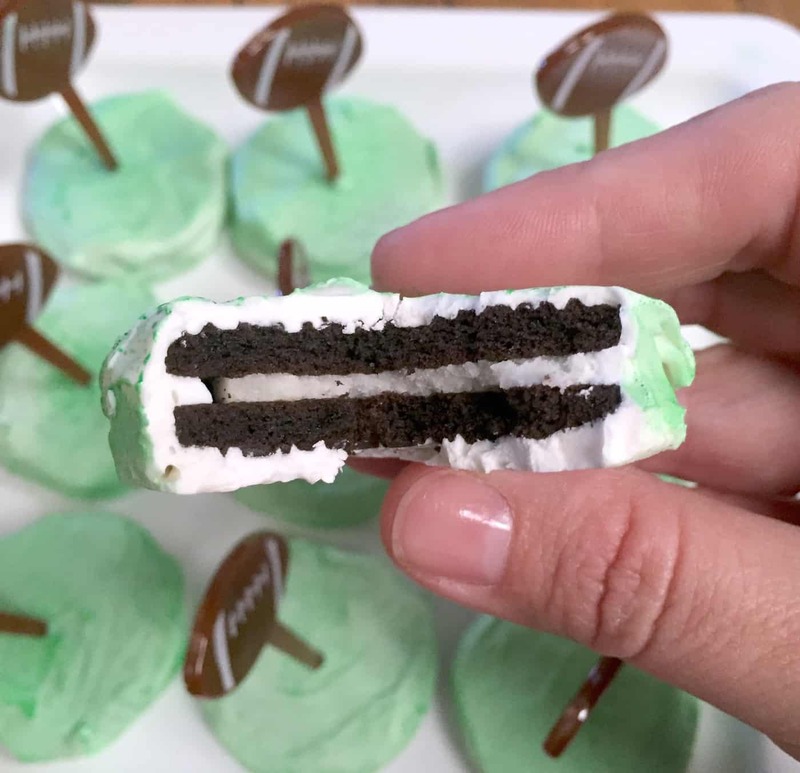 And of course, you can try my Field Goal OREO Cookies featured in this post! Don't forget the beverages. My beverage of choice at every celebration is an ice-cold Coca-Cola. It goes so well with the recipes I've assembled. Keep your cooler full! Would you ever host an ugly football sweater party? I'd love to hear in the comments! Learn to Make Your Own Magnets! Wow this is such a cool idea. I love this!! Such a fun idea for game day!! Football parties are my favorite! These sweaters are fantastic! This is awesome, love the ugly football sweaters!! 😀 Those OREO cookies look so yummy. Great job Amy! !